All tests were taken using a Sandisk Extreme Pro (UHS-1 / 45BM/s) 8GB SDHC memory card, Program Mode, Flash off, ISO Auto and all other settings at the factory defaults unless noted otherwise. The PowerShot ELPH 510 HS continues the Digital ELPH tradition of bringing you powerful features and ease of use in a stylish and compact metal shell. ...You are looking for a compact camera that still offers a versatile zoom range for a wide range of photographic needs. Canon has taken their popular ELPH 500 HS from last year and added some new upgrades to create the PowerShot ELPH 510 HS. While some of the core features on this camera have been carried over from the 500 HS, like the 12-megapixel CMOS image sensor, DIGIC 4 processor, full HD video at 24fps, and the 3.2-inch touch screen LCD; the 510 adds an impressive 12x optical zoom lens, which covers a 35mm equivalent zoom range of 28 - 336mm. This model continues the use of Canon's newer HS (High Sensitivity) system, which combines the camera's 12-megapixel CMOS sensor with its DIGIC 4 processor and a f/3.4 lens to help the 510 HS produce better photos in lower lighting conditions without the flash. The 510 is stylish too, with a sleek, squared off body that is available in three colors; Red, Silver, and Black. With all these feature combined, the 510 HS looks to be yet another popular model in the PowerShot line up. The size and shape of the 510 is different from its predecessor, with a square body that's about the size of a deck of playing cards. Thanks to its mostly metal construction, the camera has a rugged feel to it; along with a good amount of heft, weighing in at about 7.2oz with battery and card installed. It's taller profile helped the camera fit better in my large hands, and the limited controls are well placed. Speaking of controls, all that remain are the power and playback buttons, the mode switch, and the zoom controls mounted around the shutter release. With this setup, shooting one handed is simple, and you can even operate the zoom. The camera fits well in most pockets, allowing you to carry it with you at all times. All other operations are handled by the 510's 3.2-inch touch screen LCD. This 461,000 dot screen is pretty much the same exact unit we saw on the ELPH 500 HS. It uses a resistive type system, which responds best to inputs from your fingernail or a stylus. This is the opposite of capacitive systems, like those used on most smart phones, where the "meat" of your finger is required to get a response. Once you've adjusted to the resistive display, the 510's GUI responds well to inputs. I had no issues making changes to camera settings, or changing between scene modes while using the 510. Playback is also simple, with the ability to scroll through photos by dragging your fingernail left or right, or by touching the arrows on the screen. Either way, the 510's touch screen interface was a pleasure to use once we figured out it was a resistive system. The most impressive feature, and the most dramatic change from the 500, is the ELPH 510's 12x optical zoom lens. The fact that they were able to stuff a lens like this inside a Digital ELPH frame is quite impressive to say the least. Canon has basically taken an ultra-compact ELPH camera and turned it into a super-zoom, while still maintaining the ELPH's petite size. The lens itself is quite versatile, offering a rather wide range starting at 28mm, extending out to 336mm (in 35mm equivalence). Meaning this one little camera that fits in your pocket can cover a vast range of photographic subjects, whether you're shooting family and friends indoors, enjoying the landscape outside, or trying to tightly frame a football player across the field; the 510's lens has you covered. To help combat blur caused by camera-shake, Canon has included their optical image stabilization technology into the 510 (Lens-Shift type), along with their new Intelligent IS system. Combined, these technologies will help you capture sharper hand-held telephoto shots, as well as increase the likelihood that your indoor or low-light shots will be nice and sharp. Looking over our samples, the lens helped the 510 capture sharp images across the zoom range. I noticed slight traces of chromatic aberrations on the edges of objects with extreme contrast, as well as minimal barrel distortion and pin cushioning at the wide angle and telephoto extremes; respectively. Image quality from the 510 HS is overall pleasing. Outdoors the camera can produce beautiful photos that show good exposure and accurate colors. When shooting in Smart Auto, you will notice that colors are a bit more saturated, which may not be 100% natural; but many will appreciate the bump in color. We found Program mode created the most accurate colors, and recommend that exposure mode for those who are seeking more natural colors in their photos. Sharpness and contrast are also pleasing, and we saw minimal amounts of edge softness throughout the zoom range. I did notice that Smart Auto would at times create a softer looking image, which could be from the additional processing to those images. When critically viewing images at 100%, you can see a good amount of detail, along with some noise. Again, Smart Auto seems to produce more noise than when using Program mode, which can been seen in some of our civil war reenactment photos. While these photos look great at full screen resolution, at the pixel level you can see a great deal of noise that causes some smearing of fine details. While this is a typical occurrence with point-n-shoots, I was a bit surprised to see this with the 510. Albeit, it's not likely the average user will even see this, as they normally view images at full screen on their PC/Mac, and their prints usually range between 4x6 - 8x10. The built-in flash is designed to help you illuminate subjects in marginal lighting, and the 510's tiny flash boasts an maximum effective range of 10.2 feet at wide angle. This is a pretty anemic range, meaning you will want to stay as close to your subject as possible. We found that in Smart Auto, the camera would boost the ISO just enough to get some decent flash coverage, without creating too much noise. However, we also saw some white balance issues, where the camera creates rather warm images when shooting with the flash. These photos still look good, but you may notice that your subject's flesh tones are a bit rosier than normal. The 510's face detection system worked very well, finding and locking on to faces quickly and accurately. Like most any current digicam, the 510's face detection system helps ensure both focus and exposure are optimal for faces within the frame. Image noise was a mixed bag with the 510. While looking at our M&M man ISO series, you can see that the camera handles noise well all the way up to ISO 1600 when shooting in Program mode. Even the ISO 3200 setting look usable for small prints. However, when shooting in Smart Auto mode, we noticed higher levels of noise in photos, even when outdoors due to the camera choosing higher ISO settings; we saw up to ISO 400 with bright sunlight outdoors. Overall, the camera does handle noise well, but if you want the best performance we highly recommend Program mode over Smart Auto. Video recording is as simple as touching the bright red Movie record button the LCD screen; no matter what shooting mode you are in. The 510 HS offers 1080p HD (24fps), 720p (30fps), and VGA (30fps) video resolution options, with stereo sound. It also boasts an iFrame Movie mode (located in the Scene mode menu), which is optimized for use with Apple devices, making it easier to edit videos, and spend less time converting formats; which can also lead to quality loss. We chose to use the full 1080p option for our videos, which we feel creates some very nice video when you consider it's being captured with a tiny point-n-shoot. I saw very little noise in our video samples, and colors were natural. My only two complaints were with the choppiness you see when panning fast (or you have a fast moving object in the frame), and the microphones. While sound quality it pretty darn good, the mics still pick up all kinds of background noise; along with the slightest breeze. 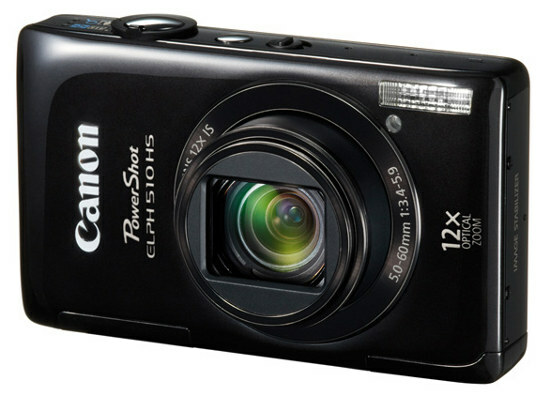 Like many of Canon's current PowerShot models, the 510 also introduces their newer Movie Digest mode, which records a short video clip before each photo you capture. This allows you to not only capture the moment at hand, but the seconds leading up to it as well. Battery life was not quite where I had hoped it would be. When the 510 first came in, I thought it was nice that the battery / memory compartments were separate from each other; then I saw the size of the 510's battery. It uses a tiny 3.5V, 870mAh NB-9L Li-ion battery pack, which is smaller than a single AA battery. While I understand battery technology has come a long way, this pack only offers 870mAhs of power, which Canon claims will be good enough for up to 170 shots. That's one of the lowest battery life claims we've seen in a long time. While we had no problem taking the 510 out for a half day of shooting, this dismal battery life really takes away from this versatile camera. Luckily, the 510 does charge the battery out of camera in the included AC charger, which has handy fold away prongs for easy storage in your bag. This means keeping an extra battery (or TWO) is not a problem, since you can charge one pack while using another. A spare NB-9L will set you back about $60 USD direct from Canon. Bottom Line - I've been a Digital ELPH fan for many years. The ELPH 510 HS continues the traditions of Canon's historic line of compact cameras by offering powerful features and ease of use in a compact metal frame. The 510 boasts some nice upgrades over the 500 HS from last year, namely a sweet 12x optical zoom lens. Overall, I truly enjoyed using the 510, and only had a few gripes (noise in Smart Auto, flash range, etc.). With a street price of $350 USD or less, the 510 offers great bang for your buck. Not to many models on the market can match the quality and features you are receiving from the 510; especially not in a camera of this size.